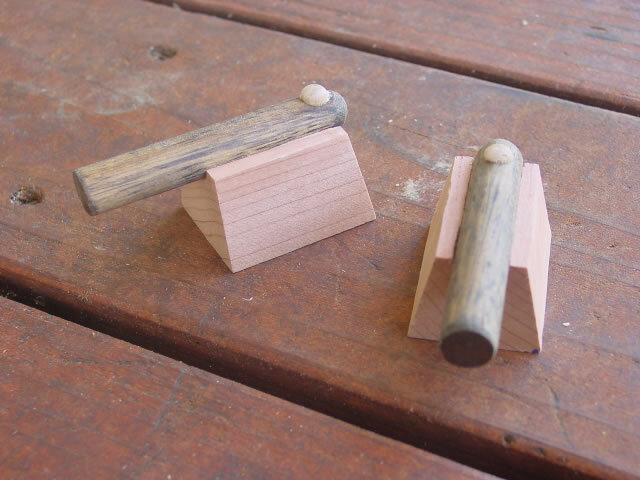 The 10 cannons were made from scrap redwood 2x6 deck planks, plus oak dowels and small (1/4") hardwood hole plugs. I used a table saw and hand drill. A drill press, however, would be very useful at this stage. 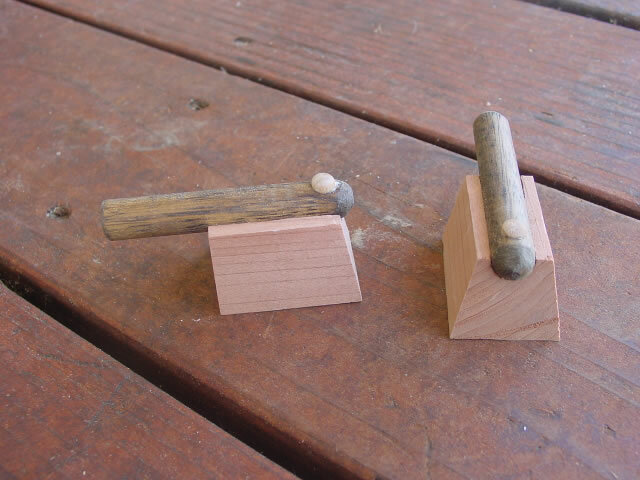 The blocks are 1 3/4" (length) x 1 3/8" (width) x 1 1/8" (height). The tops are about 1 11/16" long. The cannon barrels are 3" long. 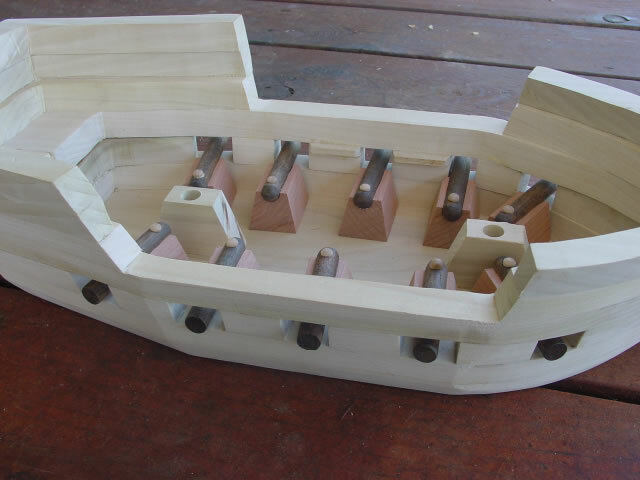 The front of the cannon base is vertical, while the sides and rear are cut with a 12 degree angle. All cuts were made on a table saw. I made a few extra blocks at this time in case I messed up later, and they were needed. I first cut the blocks extra tall to leave space to drill the groove for the barrels. I then trimmed the angled sides, back and cut off the top, leaving a half-circle groove. The barrels are made from oak dowels stained dark. A shallow 1/4" hole was drilled and the plugs glued in place. Finally, the barrels were glued to the bases. The front cannons are a tight squeeze, but they just fit. 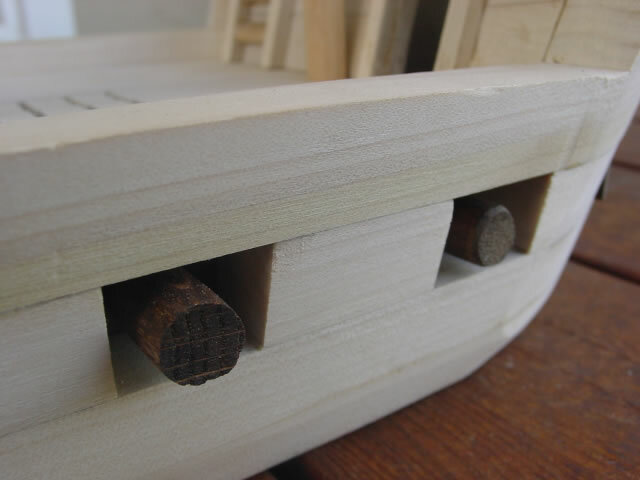 The barrels are designed to protrude slightly from the cannon ports. I thought about drilling a bit of the cannon bore, but since Ididn't have a drill press I skipped doing it.